Just as it important to take your child to a pediatrician for their medical health, it is also important to take them to a pediatric dentist for their dental health. While Delta Dental found the average age for a child’s first dental visit to be 2.6 years, The American Academy of Pediatric Dentistry recommend that a child’s first dental visit should be approximately six months after their first tooth erupts. Usually this first tooth erupts at six months of age, making the ideal age for a child’s first dental visit to be at one year of age. Although this may seem like a young age to take your child to the dentist, the earlier you begin dental treatment, the better the care will be for your child’s primary teeth. Even though these teeth will eventually be naturally lost, it is still important to keep them healthy. Despite being temporary, primary teeth have many essential functions and need to be kept healthy to properly carry out these functions. One of the most important functions of primary teeth is to act as the space holders for permanent teeth. Primary and permanent teeth erupt in the same order and the primary teeth ensure that there is adequate space in the mouth for the permanent tooth to erupt into. If the primary tooth is prematurely lost, other teeth may begin to shift into the remaining space and this could cause issues when the permanent teeth begin erupting. Another function of primary teeth is to help the child eat and speak correctly. Primary teeth that have been damaged or lost can cause speech development issues that may carry over after the permanent teeth have erupted. Lost or damaged primary teeth can also negatively affect their ability to eat certain foods. 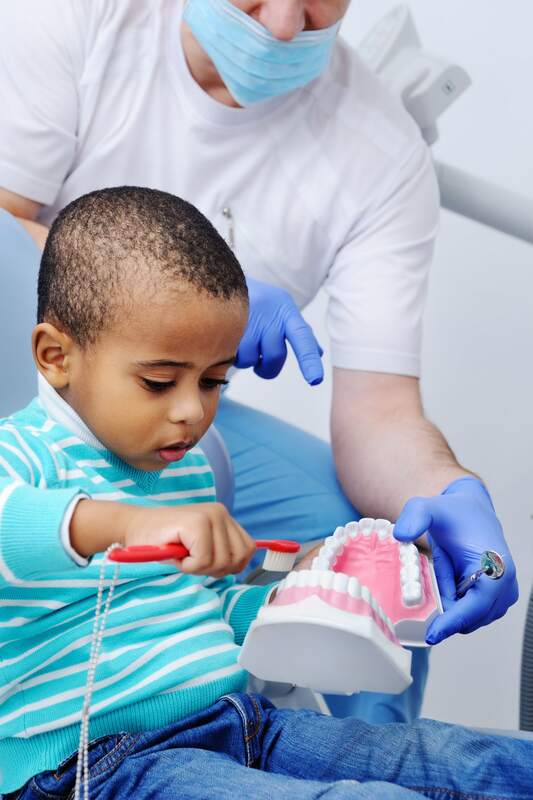 In addition to ensuring adequate care for your child’s primary teeth, visiting a pediatric dentist at an early age will help them to develop less anxiety about the dentist. Younger children generally feel less anxiety about situations, and taking your child to the dentist early on can possibly prevent them from developing major dental anxiety. Plus, pediatric dentists are specially trained to deal with children, so they will be able to help give your child a positive experience. Having positive dental experiences early on will help with the rest of their dental care later on. However, even if your child is the more common age of two to three for their first visit to the pediatric dentist there are a few things that can be done to decrease their anxiety. One thing that can be done is to schedule yourself a dental appointment before your child’s appointment and let your child watch. Make sure to explain everything that is happening so you can show your child a trip to the dentist is not something to be afraid of. You can also play “dentist” with your child in preparation for their appointment. In this way, it makes their appointment seem more like a game while also getting them familiar with what will happen. Although it is preferable to first have your child visit a pediatric dentist at one year of age, don’t avoid taking them if you have missed that marker. The sooner you bring your child to visit us a Smiling Kids Pediatric Dentistry of Indianapolis, the sooner we can help them with their dental health.